Unlike with the DR55, instead of repeatedly attempting to program a pattern only to find that you messed up the bassdrum on the 16th step so you have to start all over again, the sounds and accent on the CB55 board are triggered externally using standard trigger pulses. With the optional trigger conditioning circuit installed you can use also use gate signals, or trigger pulses longer than 10ms. 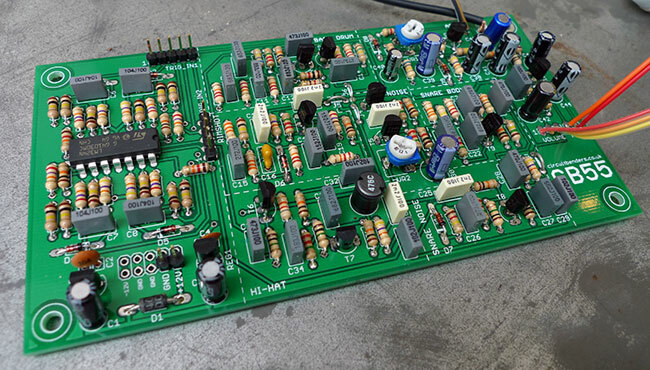 To get any sound out of this board once you have built it, you will have to have a source of 5v trigger signals or gates. These could be sourced from a midi to trigger or gate converter, another drum machine with a trigger output such as a TR707 or DR110, a modular synth, or some other bit of kit capable of producing the appropriate triggers. You can download the build guide and parts list from HERE or HERE, There is also a dedicated board on our forum for any build queries you may have, or potential mods you want to suggest and discuss. To take a look click HERE. The schematic is also available via the forum. This is just the bare unpopulated PCB. We do not supply kits for the full build, but you can find nearly everything you'll need at very good prices and with cheap fast shipping at Tayda Electronics in Thailand. Alternatively we can recommend CPC or Farnell in the UK, or Mouser and Digikey in the US. No doubt there are dozens or more suppliers that could be used, but you may find that some of the smaller sellers have difficulty with some of the more esoteric cap values, which is the main benefit of Tayda, as they tend to have all of them. 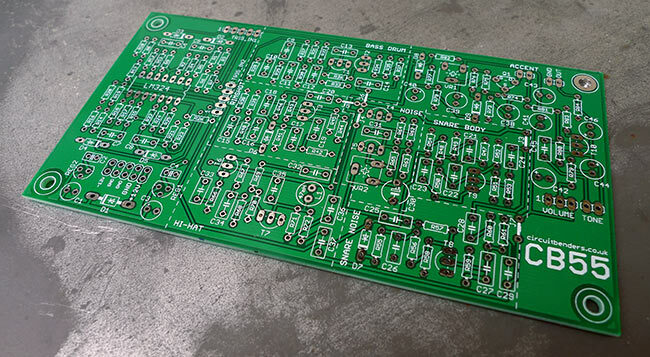 Please note that due to its size (139mm x 72mm), this PCB is not designed specifically to be used in a eurorack modular system, but we have included a eurorack power connector just in case somebody wanted to try and kludge something together. Below are some demos of this board in action. 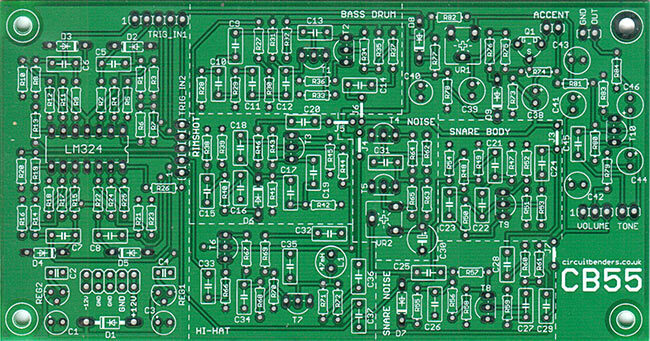 This is the basic board with no mods.